Click image to read the flyer. 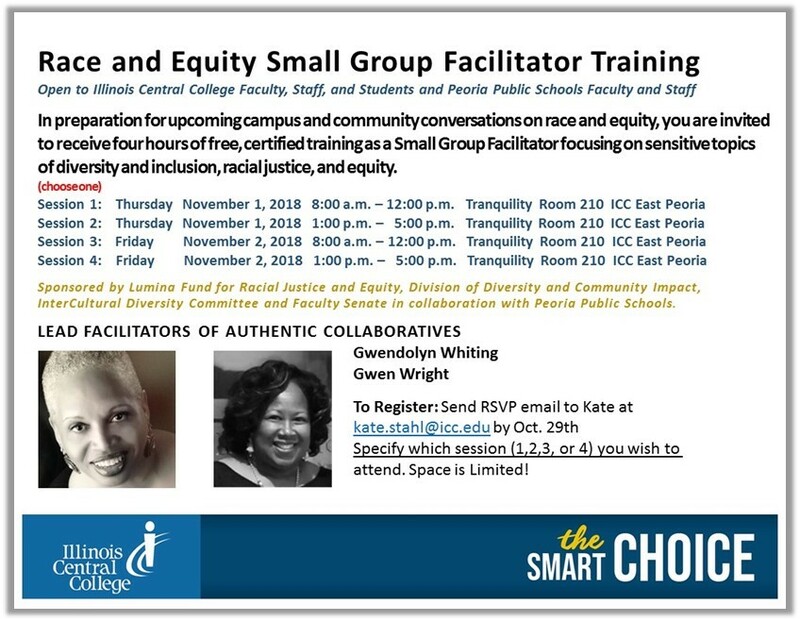 With funding provided from the Lumina Foundation Fund for Racial Justice and Equity, Illinois Central College, in collaboration with Peoria Public Schools (PPS), will host campus and community discussions on sensitive topics such as diversity and inclusion, racial justice and equity. These discussions will begin in early spring semester. You are invited to attend a FREE, four-hour training session to become certified as a Small Group Facilitator. This opportunity is open to ICC faculty, staff, and students, as well as PPS faculty and staff. Participation in the training does not obligate you to facilitate a session this spring. To register, RSVP with your preferred training session number to Kate Stahl at [email protected] by October 29. Space is limited. 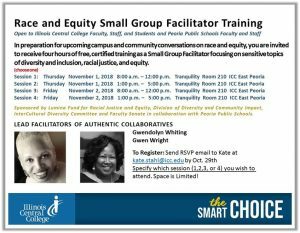 Sponsored by Lumina Fund for Racial Justice and Equity, Division of Diversity and Community Impact, InterCultural Diversity Committee and Faculty Senate in collaboration with Peoria Public Schools.